Today we (and I use the term loosely) put in a water level indicator on the new header tank. I wasn’t much help as I damaged my knee putting the header tank in and am currently wearing a very fashionable leg brace. 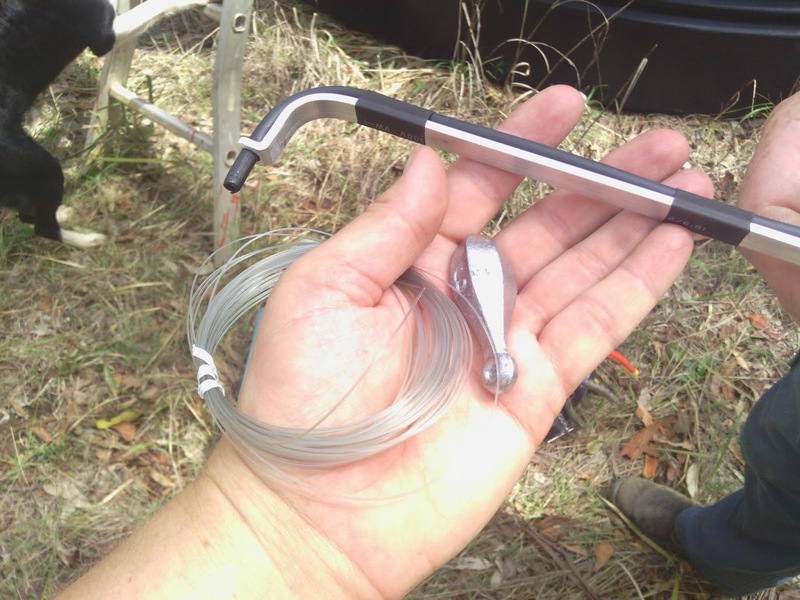 My partner found an indicator kit online, it’s Australian made and owned and uses about 50% recycled items. He is so impressed with it that he is going to stock them at work (Rural Energy Supplies). This is what came in the kit, along with some clear, easy to read instructions; fishing line, a sinker and a fishing line guide thingy. 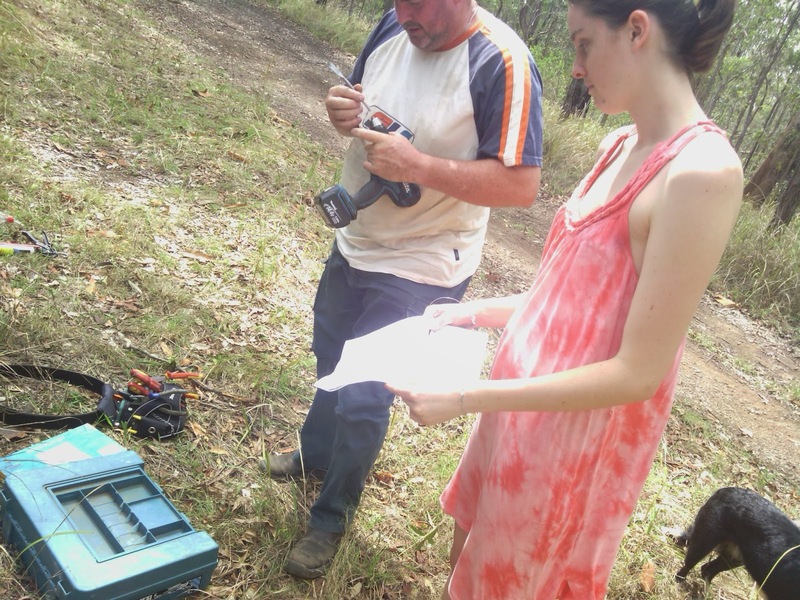 Then the instructions are pored over by all involved. 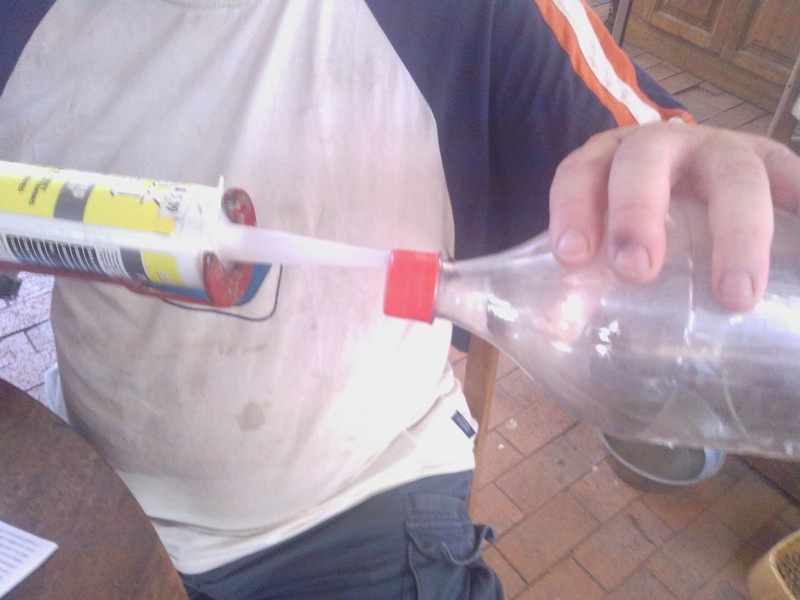 The basic idea is to take a coke bottle and a milk bottle; seal the coke bottle up so it’s air tight and fill the milk bottle with sand and water. 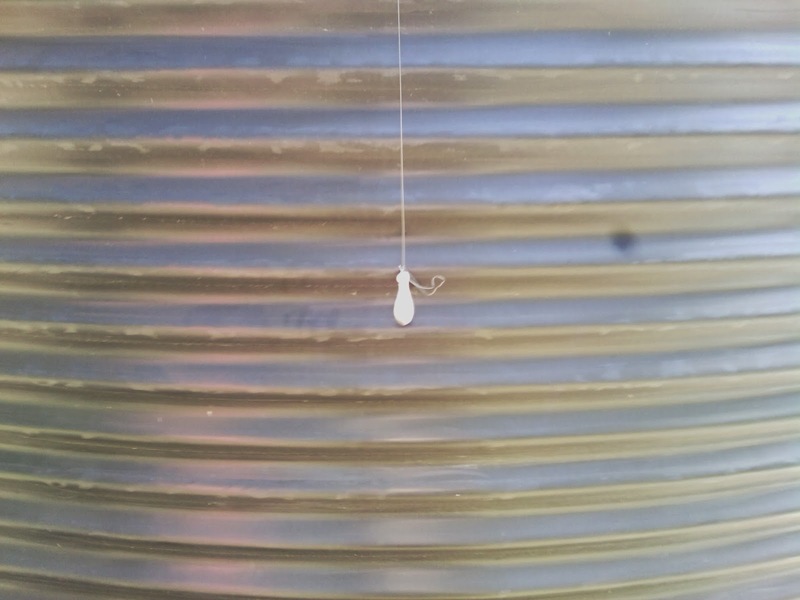 Fishing line (supplied) is then passed through the little guide thingy (supplied) and one end of the fishing line is passed through a pre-drilled hole in the top of the tank. 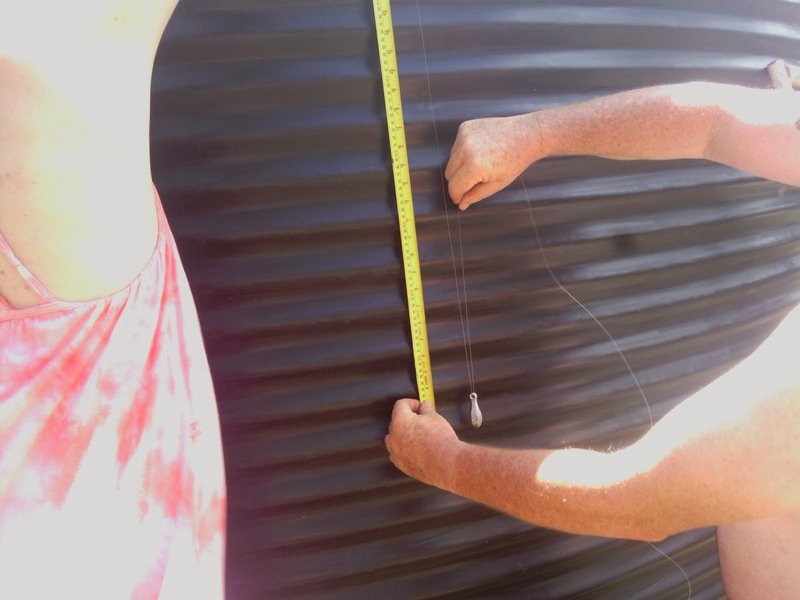 As our hole in the top of the tank was on the opposite side of the tank to the inspection hole we had to spend a long time swearing and cursing while trying to hook the fishing line inside the tank with a piece of bamboo. 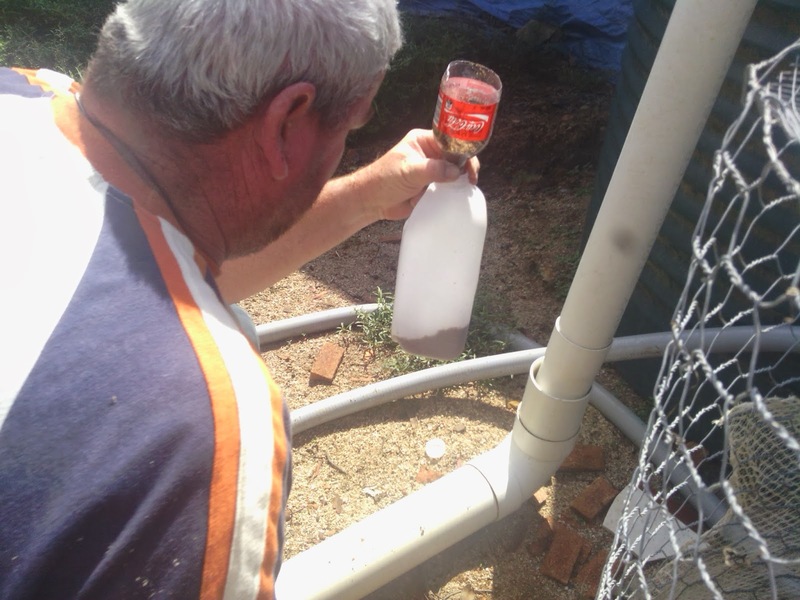 The fishing line end inside the tank was then passed through the handle of the milk bottle and tied to the coke bottle float. 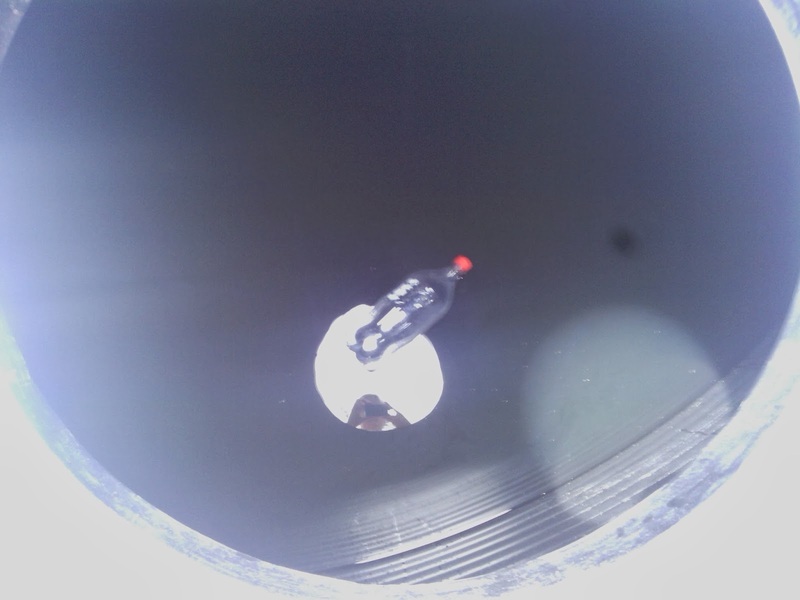 The milk bottle was then lowered into the bottom of the tank. Finally the sinker was tied to the outside end of the fishing line so it hangs at the current level of the water in the tank. 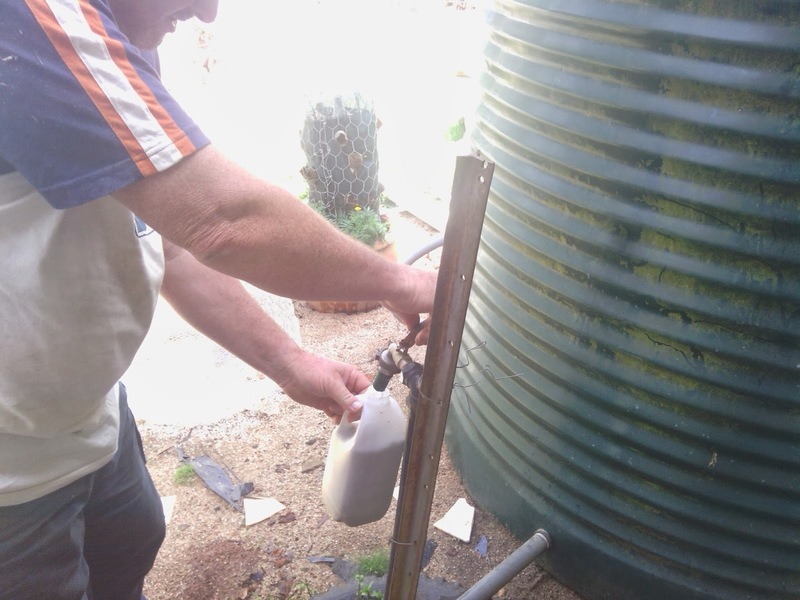 To avoid frustration it is really important to remember/write down/tell someone what the measurement is when measuring the water level inside the tank so it can be transferred to the outside of the tank. Now I can check the water level of the tank as I walk home from work, instead of climbing the ladder, unscrewing the inspection hatch and looking in, or smacking the side of the tank; I am very impressed. Where did you get the kit from looks like something that is easy enough for me to use and saves me getting up on the dam ladder!! Hi Shay, Kev' got it online (hit the link 'indicator online') or go see Kev' at the Co-Op; he is stocking them, I just don't know if the order is in yet. It was very easy to put up, although I only watched and took photos. I'm sure you could do it easily. I think I will paint the little sinker thingy pink so I can see it from the house. Thanks for posting this! Such a simple and elegant solution to the problem. I currently use the “hit the tank with some plastic pipe” method, which has numerous drawbacks. That's the method I have used in the past too, it's not very precise is it. Thanks for the comment Samantha. The link to the website where we bought the kit is linked to the text in the blog. thanks will do that, tapping the tank with a shoe is hit and miss!